Arbitrators as Lawmakers analyses how arbitrators make rules that guide, constrain, and define the process and substance of international arbitration. Arbitral lawmaking is an emerging topic with the existing literature not providing the needed analysis of legal theory and arbitral practice. 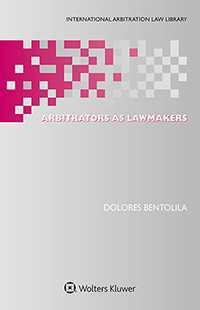 This book aims to bridge the gap by explaining the three different stages of arbitral lawmaking – before, during, and after the rule is made: first stage is the situation of the arbitrator and the legal framework governing it; second stage is the process of lawmaking; and finally the third stage is when the consistent arbitral solution is launched to a wider public. What is the relationship between international arbitration and the law and courts of the seat? What is the role of international tribunals in enforcing and controlling investment arbitration? What is the scope of arbitrators’ freedom in decision-making? What constraints limit arbitrators’ decision-making and contribute to consistency? Is international arbitration capable of paying deference to past arbitral decisions? Which rules have arbitrators created in procedural and substantive matters? What is the role and status of consistent arbitral decisions? Is there an arbitral legal system? The answers to these questions are drawn from arbitral decisions made available to the public, clarifying important issues about jurisdiction, procedure, applicable law, interpretation of substantive rules and instruments, and remedies. Providing a thorough and multidisciplinary analysis of the actors, process, and outcome of arbitral lawmaking, this study shows how arbitrators create principles of law through consistent arbitral decision-making. As such, it is of immeasurable and lasting value to practitioners, scholars, arbitral institutions, and international organizations worldwide, for all of whom it will not only enable an understanding of arbitral decision-making and arbitrator-made rules but also foster transparency and accountability in the process of arbitral decision-making.